LANSING — Three Lake Superior lighthouses, including one in the Upper Peninsula, were recently added to the National Register for Historic Places. 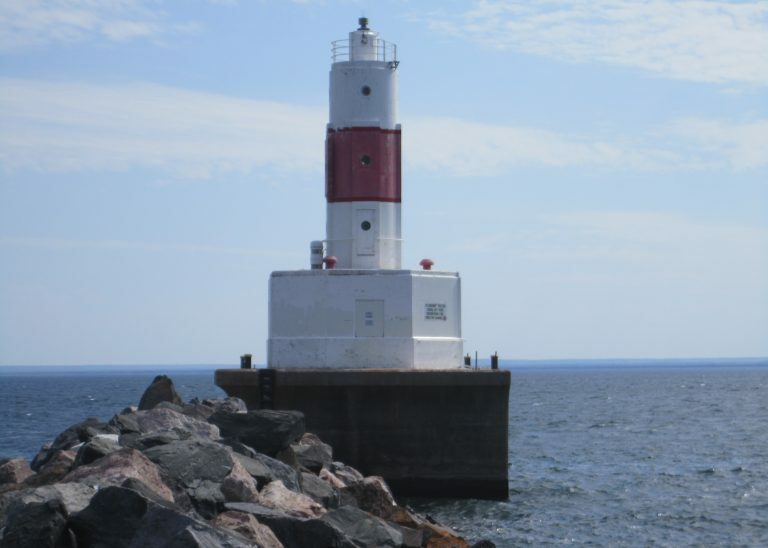 The Presque Isle Harbor Breakwater Light was built in 1941 to assist in shipping out iron ore mined in Michigan’s Upper Peninsula, according to U.S .Coast Guard historian Daniel Koski-Karell, who applied to get the lighthouses added to the register. Standing in Presque Isle Harbor, the light is still used for this purpose today. The harbor is the ninth-busiest in the Great Lakes, according to the National Register application. In addition to shipping out iron ore, the harbor receives freighters bearing coal to fuel the Presque Isle Power Plant. The Presque Isle Light emits a red flash every four seconds that is visible for 11 miles in clear weather, according to the application. It uses an electronic foghorn and relies on solar-powered batteries for energy. The other two additions to the National Register are Minnesota’s Duluth Harbor North Pier Light, constructed in 1910, and South Harbor Breakwater Outer Light, constructed in 1901. Both were built to help ships navigate Duluth’s shipping canal, Koski-Karell said. The North Pier Light emits a red light visible every three seconds for up to 16 miles on a clear day, according to the application for the designation. The Breakwater Outer Light emits a fixed green light visible for up to 17 miles in clear weather. The Presque Isle Light emits a red flash every four seconds that is visible for 11 miles in clear weather, according to the application. Both Duluth Harbor lighthouses had antique beacon lights that were replaced by modern LED lights in 2014. Previously, the Duluth Harbor South Breakwater Outer Light used a Parisian- made beacon light from 1877, according to the application. The mostly symbolic gesture of historic designation is a step in finding a more permanent solution for maintaining the lights, said National Register historian Alexis Abernathy. There are now 144 Great Lakes Basin lighthouses on the National Register of Historic Places, said National Park Service maritime historian Anna Holloway. Advances in navigational technology have eliminated the Coast Guard-employed lighthouse keepers who handled maintenance, Koski-Karell said. Modern lighthouses are automated and maintenance has been reduced to occasional check-ups. The Coast Guard still needs the Presque Isle and Duluth Harbor lights operational, Koski-Karell said. Their register listing helps open the door for them to be donated to a nonprofit organization or auctioned to a private owner. Of the Great Lakes Basin’s 388 lighthouses, 70 percent provide navigational support, according to the Great Lakes Lighthouse Keepers Association based in Mackinaw City. “One of the major reasons for transferring the properties is that as the lighthouses age, the cost (of maintenance) is very burdensome to the Coast Guard,” Koski-Karell said. New ownership would take over maintenance duties under Coast Guard supervision. Getting the Presque Isle and Duluth Harbor lights to that point will take three to five more years, he said. The Coast Guard must first clean the lighthouses and decide whether to give them up. Holloway said new owners often turn lighthouses into homes, museums or lodging for tourists, The lights would go to auction if the Coast Guard cannot find nonprofit groups willing to maintain and keep them open them for educational use, Holloway said. Since the National Historic Lighthouse Preservation Act of 2000, she said, 14 Great Lakes Basin lighthouses have been sold to private owners, 13 have been given to local governments, 16 have been given to nonprofit groups and 2 have been transferred to other federal agencies. The remaining 343 lighthouses in the basin are still owned the by the Coast Guard. There are 82 lighthouses available for tours in the Great Lakes Basin, according to the Lighthouse Keepers Association. Josh Bender writes for Great Lakes Echo. LANSING — Water warriors from tribes across the Great Lakes region are preserving an important relative. It’s water – a resource so important that tribes refer to it in such personal terms. “Water is a living resource, and we share an interdependent relationship with it,” said Daugherty Johnson III, environmental services manager at the Little Traverse Bay Bands of Odawa Indians, in Harbor Springs.